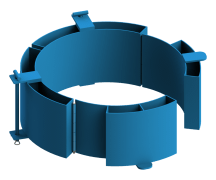 Drum Handling Accessories - Diameter Adaptors for your smaller drum. 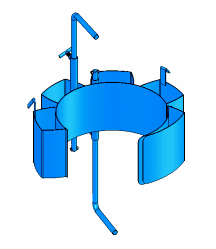 Accessories for Fiber and Plastic Drums. Diameter Adaptors with integrated hold-down brackets at top and bottom of your drum. The hold down brackets adjust for a drum up to 38" (96.5 cm) tall. Diameter Adaptors are available in standard carbon steel, type 304 finished stainless steel, or with spark resistant parts. Please see model numbers in charts below. 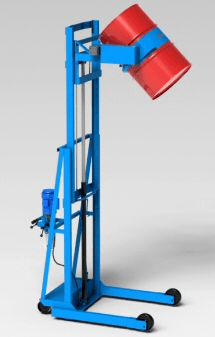 Model 55/30-19GR Diameter Adaptor only for 19" (48.3 cm) diameter 30-gallon (114 liter) steel drum. 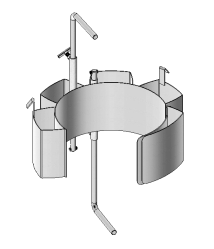 This Diameter Adaptor is required for Morse models with 3-Piece Drum Holder to handle a 30-gallon (114 liter) drum, such as 185G, 285G, 185GR, or 285GR Series. It can also be inserted into the MORCINCH Drum Holder. 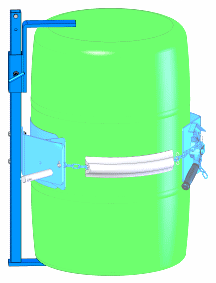 Two methods of handling a 55-gallon (210 liter) plastic drum with your Morse drum handling equipment. 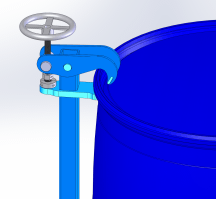 Top Rim Clamp for your 55-gallon rimmed plastic drum. Bracket Assembly required for a rimless plastic drum. Can also be used for a plastic drum with or without a top rim. 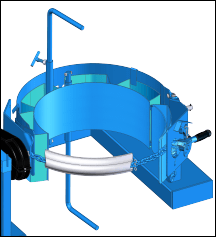 The Bracket Assembly is also recommended to more securely hold your fiber drum. Diameter Adaptor 21.5" to 22"
(54.6 to 55.9 cm) 11 Lb. (5 kg) L24" W16" H12"
55/30-20.5 Diameter Adaptor 20" to 20.5"
(50.8 to 52.1 cm) 20 Lb. (9 kg) L24" W16" H12"
55/30-19 Diameter Adaptor 18.5" to 19"
(47 to 48.3 cm) 24 Lb. 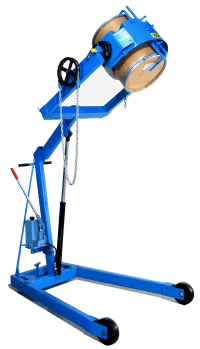 (11 kg) L24" W16" H12"
55/30-17.5 Diameter Adaptor with integrated hold-down brackets for drum up to 38" (96.5 cm) tall. Also fits 20-gallon Rubbermaid Brute model # 2620. 17" to 17.5"
(43.2 to 44.5 cm) 35 Lb. (16 kg) L28" W19" H16"
55/30-16 Diameter Adaptor with integrated hold-down brackets for drum up to 38" (96.5 cm) tall 15.5" to 16"
(39.4 to 40.6 cm) 35 Lb. (35.6 to 36.8 cm) 36 Lb. (47 to 48.3 cm) 38 Lb. (17 kg) L31" W26" H11"
55/30-32G Diameter Adaptor for 32-gallon Rubbermaid Brute model # 2632 30 Lb. 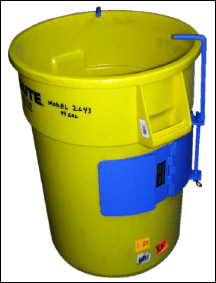 (13.6 kg) L28" W19" H16"
55/30-44G Diameter Adaptor for 44-gallon Rubbermaid Brute model # 2643 30 Lb. 55/30M-22 Spark Resistant Monel Diameter Adaptor 21.5" to 22"
(54.6 to 55.9 cm) 14 Lb. (6.4 kg) L24" W16" H12"
55/30M-20.5 Spark Resistant Monel Diameter Adaptor 20" to 20.5"
(50.8 to 52.1 cm) 23 Lb. (10.5 kg) L24" W16" H12"
55/30M-19 Spark Resistant Monel Diameter Adaptor 18.5" to 19"
(47 to 48.3 cm) 22 Lb. (10 kg) L24" W16" H12"
55/30M-17.5 Spark Resistant Monel Diameter Adaptor with integrated hold-down brackets for drum up to 38" (96.5 cm) tall. 17" to 17.5"
(43.2 to 44.5 cm) 24 Lb. 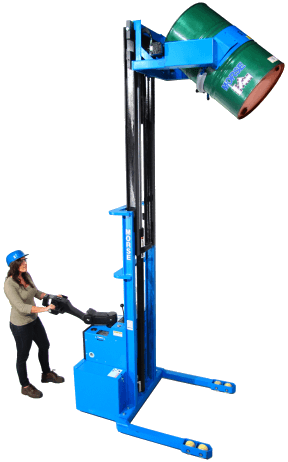 55/30M-16 Spark Resistant Monel Diameter Adaptor with integrated hold-down brackets for drum up to 38" (96.5 cm) tall. 15.5" to 16"
(39.4 to 40.6 cm) 26 Lb. (12 kg) L24" W16" H12"
(35.6 to 36.8 cm) 37 Lb. (17 kg) L24" W16" H12"
55/30SS-22 Stainless Steel Diameter Adaptor 21.5" to 22"
(54.6 to 55.9 cm) 20 Lb. (9.1 kg) 21.5" to 22"
55/30SS-20.5 Stainless Steel Diameter Adaptor 20" to 20.5"
(9.1 kg) 20" to 20.5"
55/30SS-19 Stainless Steel Diameter Adaptor 18.5" to 19"
(11 kg) 18.5" to 19"
55/30SS-17.5 Stainless Steel Diameter Adaptor with integrated hold-down brackets for drum up to 38" (96.5 cm) tall. Also fits 20-gallon Rubbermaid Brute. 17" to 17.5"
(15.9 ) 17" to 17.5"
55/30SS-16 Stainless Steel Diameter Adaptor with integrated hold-down brackets for drum up to 38" (96.5 cm) tall. 15.5" to 16"
(15.9 ) 15.5" to 16"
55/30SS-32G Stainless Steel Diameter Adaptor for 32-gallon Rubbermaid Brute 30 Lb. 55/30-44G Stainless Steel Diameter Adaptor for 44-gallon Rubbermaid Brute 30 Lb. 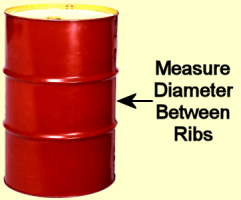 Note: Measure the outside diameter (O. D.) half way down the drum, between the ribs where the holder engages the drum. Diameter = circumference divided by pi (3.1416). Other sizes can be made on a custom basis. Drum Handling Accessories. Diameter Adaptors - Drum adapters for your smaller drum. 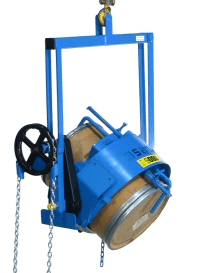 Many Morse drum handling handlers can handle several drum types and sizes when equipped with the correct size drum adapter and accessories for each drum.